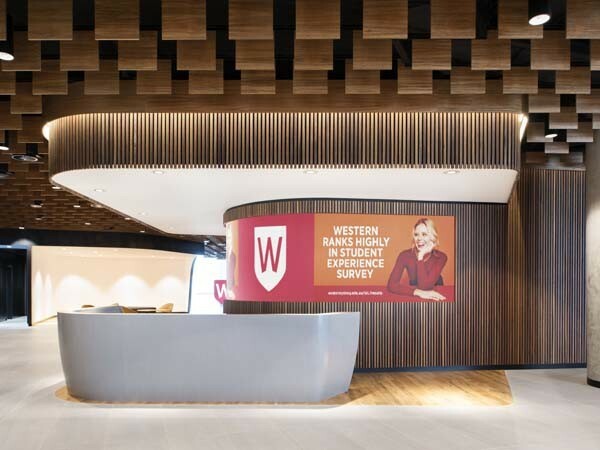 The fit-out of the Western Sydney University flagship ‘vertical campus’ at 1 Parramatta Square included tailored feature linings by SUPAWOOD on many ceilings throughout the 11 levels. Designed by Woods Bagot, the fit-out incorporated inventive acoustic ceiling lining concepts, which contributed to targeting a 5 star Green Star rating and had to meet the tight program the client demanded. Without compromising the essence of the initial concept, SUPAWOOD provided value management solutions to fit within the required budget and then supplied factory prefinished linings, which minimised on-site trades and installation time. The $40m integrated fit-out delivers world-class educational facilities for the WSU School of Business and its nearly 10,000 students. The design emphasises the creation of flexible learning spaces that can adapt to changing teaching practices into the future. Four innovative tailored products were developed and supplied factory pre-finished to suit the design concept. Square "WAVE BLADES" in SUPAVENEER Spotted Gum dominated the ground floor reception entry ceiling. This effect is reminiscent of rows of square timber bunting set in pre-curved perimeter upstands. This ceiling lining achieves a unique effect and utilised a customised fixing system to suit. SUPATILE DIT Flush ceiling tiles in SUPAFINISH Hoop Pine have been used on about 3000m² of ceilings over multiple levels in flexible learning and open collaborative spaces, breakouts and staff areas. The acoustic tiles are set within an edged upstand and feature a custom alternating diagonal slotted pattern to create extra interest. Adjacent to the lifts, lobbies on most levels are arrival lounges, which feature ceilings of custom made Boxes in Hoop Pine Plywood. The plywood boxes were pre-assembled in the factory with diagonal cross braces and designed for easy installation and joining onsite. Specially shaped mitred boxes were made and supplied to suit the non-rectangular area. Square SUPACOUSTIC floating perforated panels in SUPACOLOUR high gloss white have been used in certain multi-purpose areas to address noise reverberation. These are also set on the diagonal to achieve added aesthetics to the area. The success of these lining effects were made possible because SUPAWOOD provided a full design and construct service throughout the value management planning and the fit-out, which included detailed shop drawings and expert consultation. All linings were supplied pre-finished from the factory ready for an easy install and with PEFC certification.